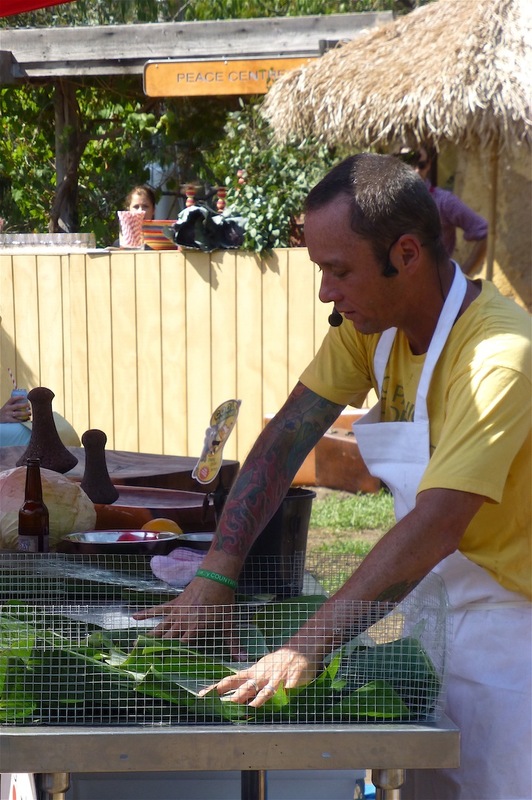 The definition of an imu can best be described as an underground steam oven; heated by volcanic rocks (pohaku) and kept moist with vegetation, preferably banana leaves – the Hawaiian word kalua refers to the process of cooking in an earth oven (ka, the; lua, hole). 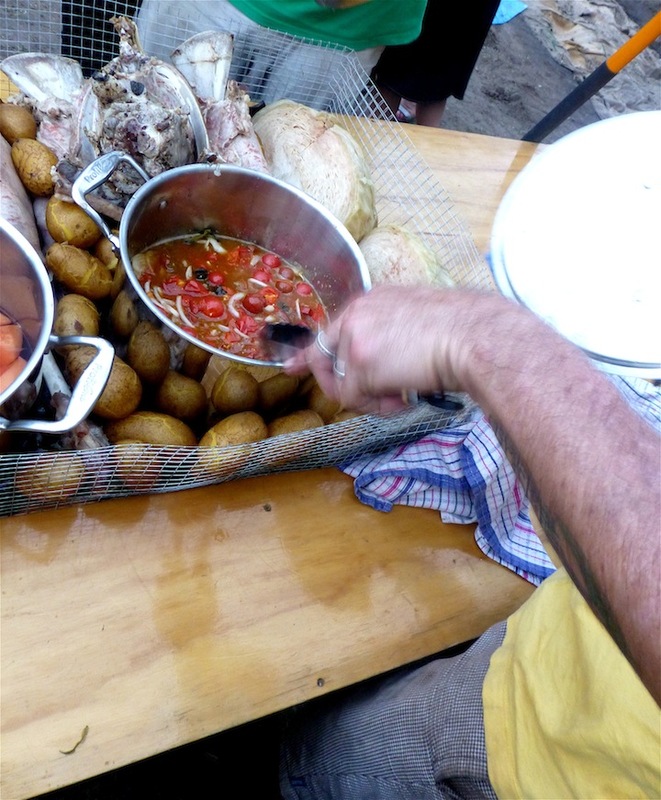 An imu is a Hawaiian cooking tradition that is centuries old where whole pigs, breadfruit, bananas, sweet potatoes, taro, chicken, and fish were all cooked as part of a celebration or a luau. 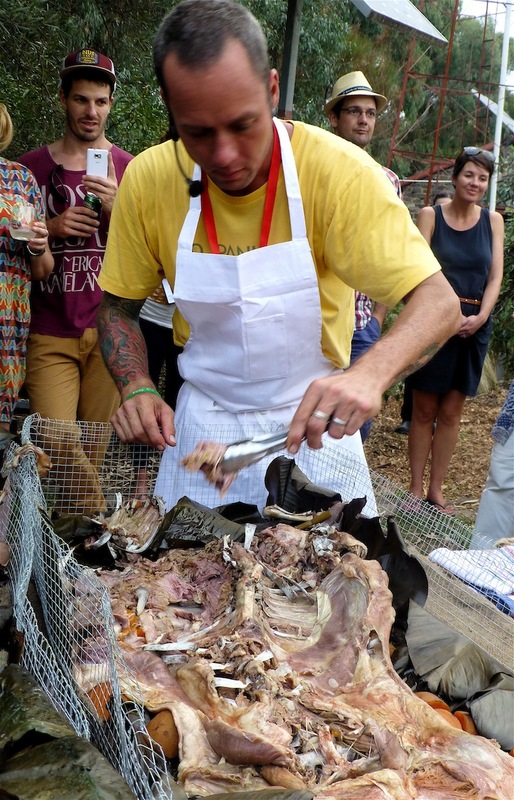 This tradition was challenged recently when Ed Kenney, from Honolulu’s Town fame had to experiment with cooking lamb in an imu, rather than pig, prior to his participation in Australia’s 2013 Melbourne Food Festival’s Earth themed Masterclass. 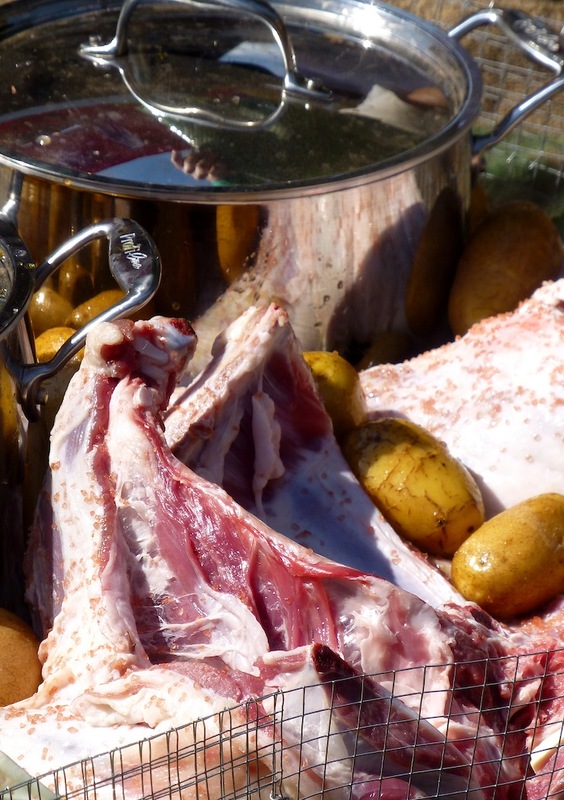 For Kenney lamb was a forced choice, as pork had been ‘requisitioned’ by fellow demonstrator, Ben Shewry from Attica for his kiwi hangi demonstration. As a result of attending this Masterclass, Brunyfire is a lot more informed on the preparation and taste of a Hawaiian imu that can be directly applied to the firepit on Bruny, thanks to the generosity of Ed Kenney. The approach to laying and firing up an imu seemed a lot more straightforward than the instructions in the little booklet I’d brought back from a trip to Maui back in 2006……. ……and seeing the action in practice was incredibly helpful, despite the many good sites there are on line that describe laying and firing an imu. 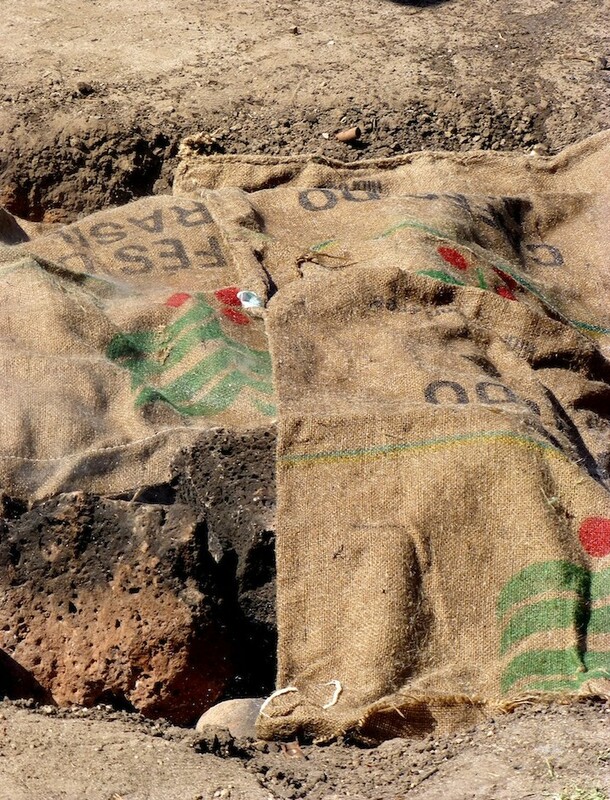 The first step in building an imu is to dig a hole about 60cm x 120cm deep – the size of the pit is dependent upon how much food is to be cooked in addition to the rocks that need to be heated, and the fuel. 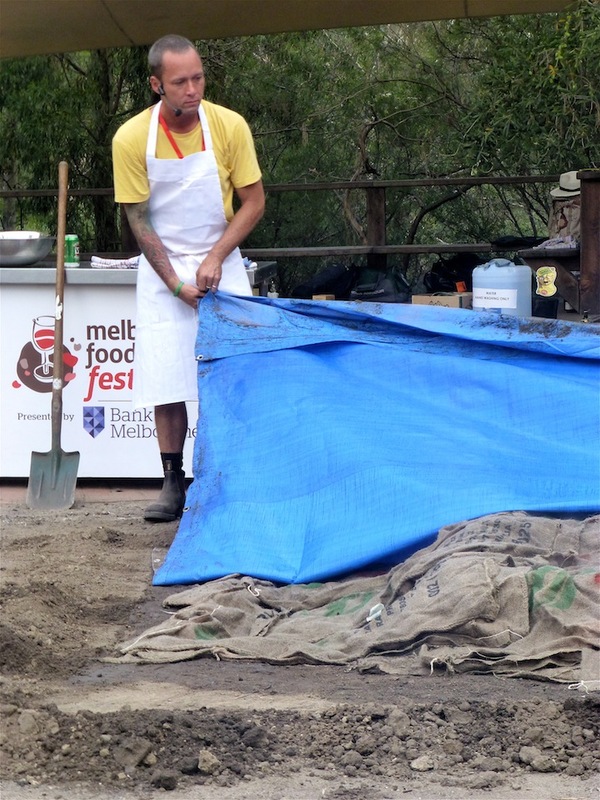 Ed had the luxury of having his hole at the Ceres Community Environment Park prepared by a digger, rather than by hand – all of which was done the day before, and the fire and food prepared laid and lit, in the early hours of the morning. This was done to ensure that we all had our evening meal properly cooked. Nevertheless, thanks to Ed’s demonstration, the whole procedure from start to finish, was made clear. 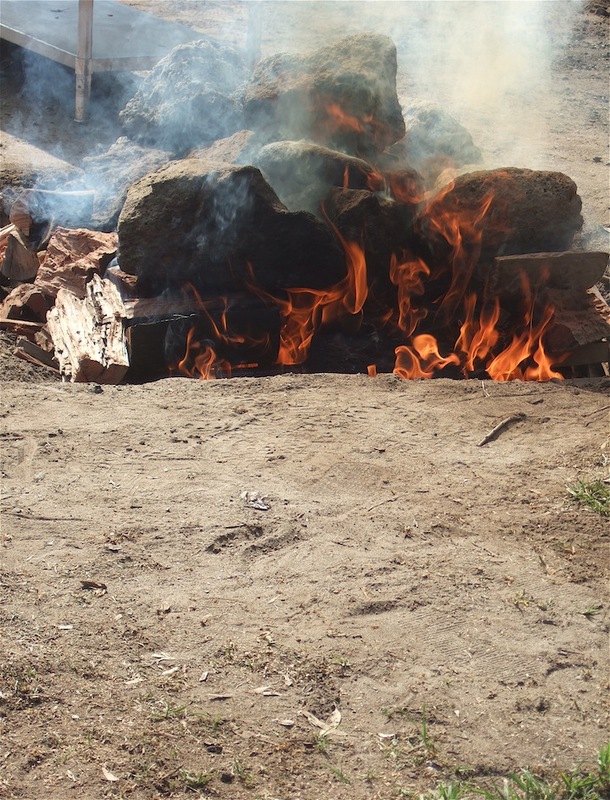 Once the hole was dug, the fire was laid with paper, kindling, larger logs and rocks…….. ……..and lit, and allowed to burn for several hours. 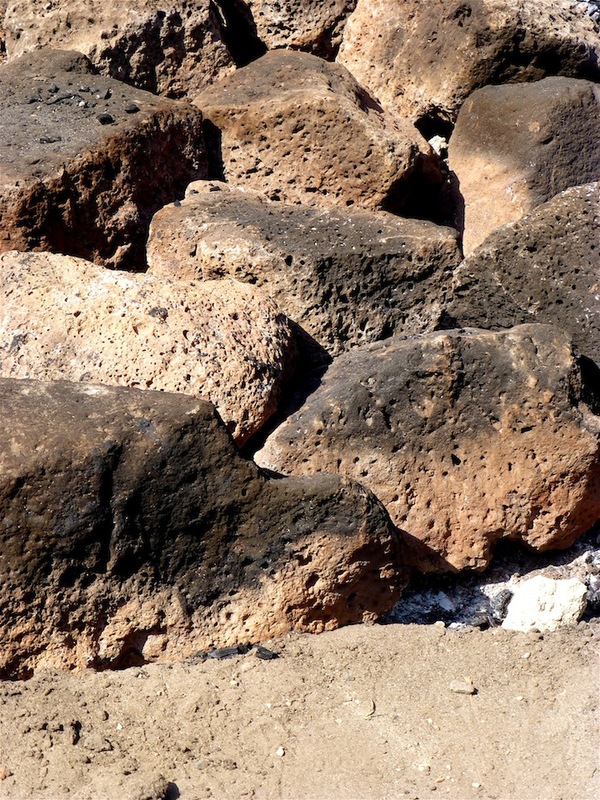 The type of fuel and rocks are important aspects for a successful fire. 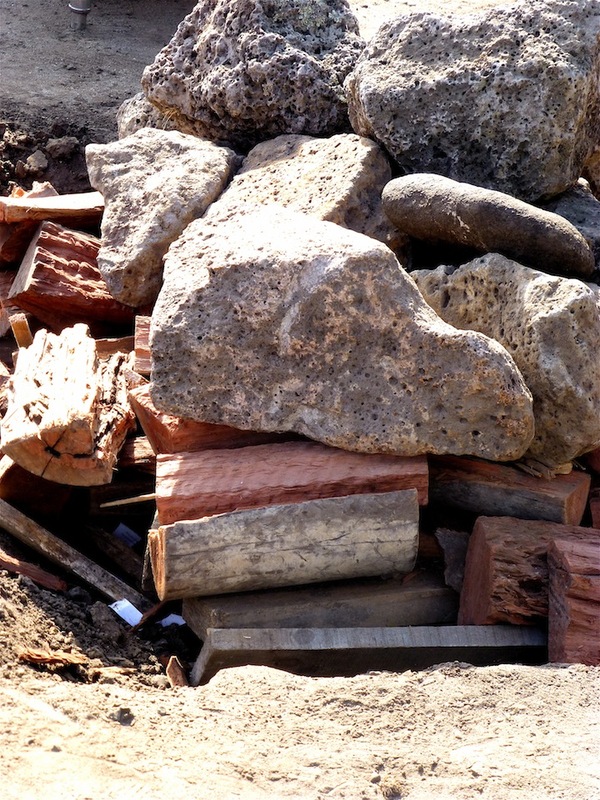 Ed had sourced volcanic rocks, most likely from a landscape garden supplier in Melbourne – he was obviously keen to use his ‘familiars’ to ensure a successful outcome. 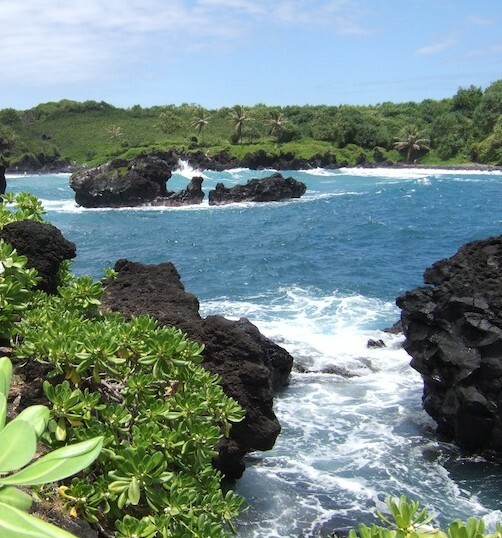 The best type of rocks to use (according to Dino Labiste’s article on Primitive Ways site) are vesicular basalt stones – such as the ancient stones in a traditional pit we saw when we were in Maui back in ’06. 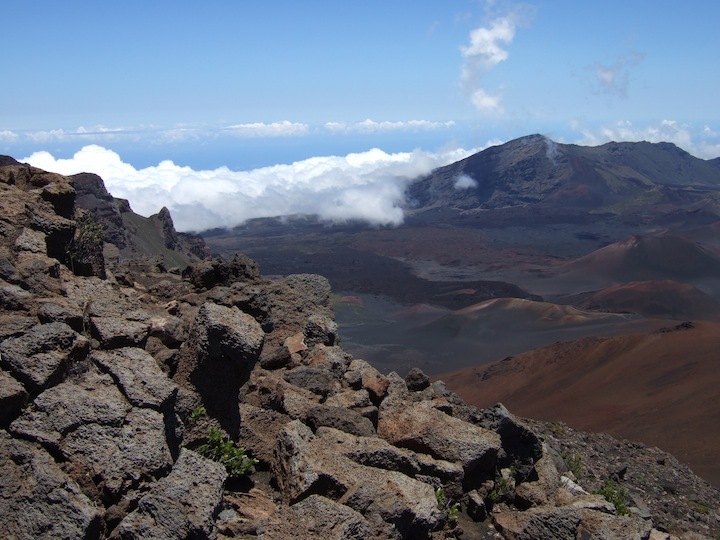 Not surprising that these are the rocks of choice, Maui is made up of the stuff, from surf…… …….to mountain top – Haleakalā volcano to be exact, in Haleakalā National Park. Vesicular basalt stones are volcanic rocks that are textured throughout their structure with cavities (known as vesicles). The ‘parent’ rock is a glassy or igneous rock, created as lava (or an extrusion of magma to the surface) and the cavities formed within it are created as trapped gases in the molten rock as it solidifies. It is the porosity and density of these rocks that help them retain heat. 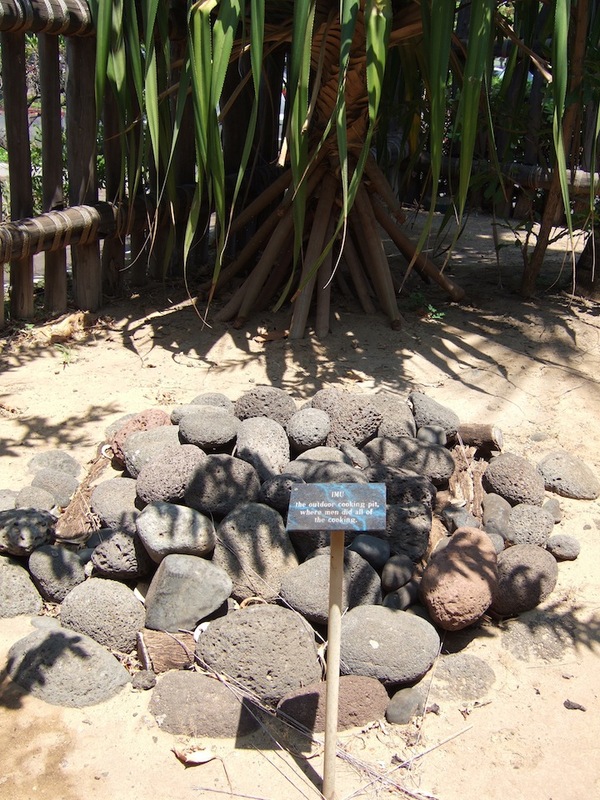 The best timber for a Hawaiian earth oven firing is koa – a type of acacia. Ed also uses mesquite which is a thorny, invasive species introduced by the missionaries to Hawaii (so the story goes), to encourage the locals to wear shoes as a result of treading on the mesquite’s thorns. Mesquite is known as ‘Kiawe’ pronounced ‘kee-ah-vey’ – the sound one makes when one step on the thorns! The kindling wood is then lit and the blazing fire heats the pit and the stones. As the wood turns to charcoal, the imu stones drop inward on the hot coals. Firing time varies from 3 – 4 hours until the stones are at their maximum heat. 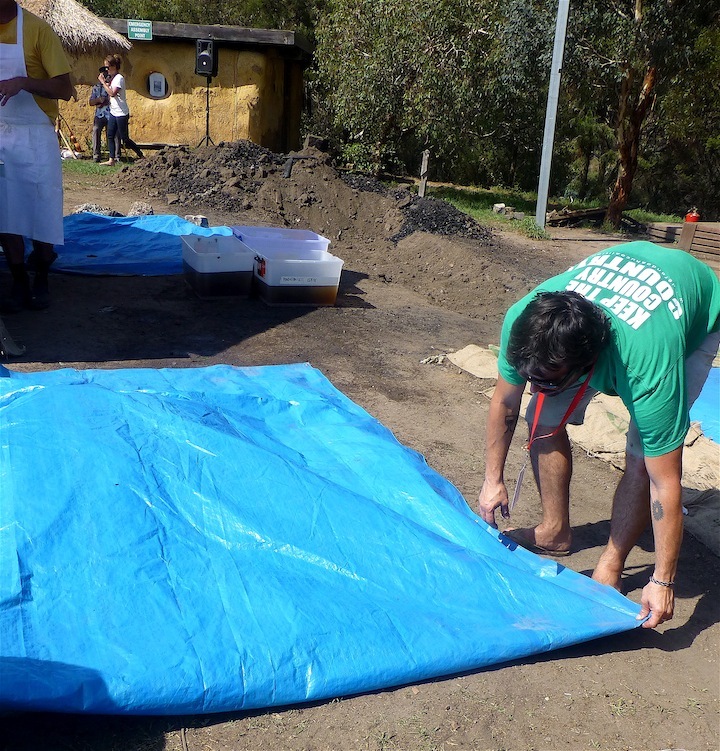 The hot stones are then leveled out with a stick or wooden tongs to an even floor on top of the coals. The key to cooking food in an earth oven, is the steam. 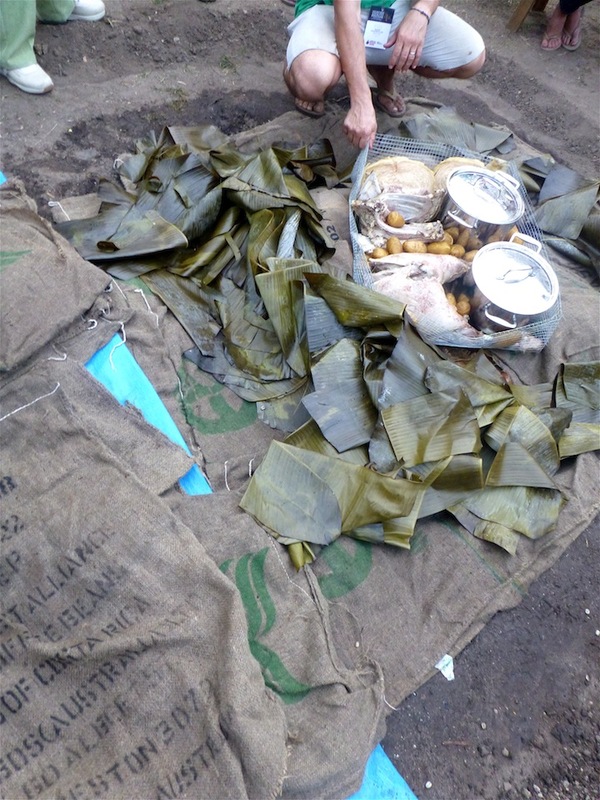 In Ed’s case, he used soaked hessian sacks directly onto the hot rocks (which he credits to Ben Shewry’s influence) as he was unable to use the more traditional crushed banana tree stalks (which have a tremendous amount of moisture to make steam) and banana leaves. Normally, he hacks the banana stalks up before putting them on the hot rocks to help release the water – these are plentiful where he’s from, so he had to compromise in the ‘burbs of Melbourne, so the steam was provided by the wet sacks and banana leaves. The banana leaf and crushed stems give imu cooked food its classic flavor. 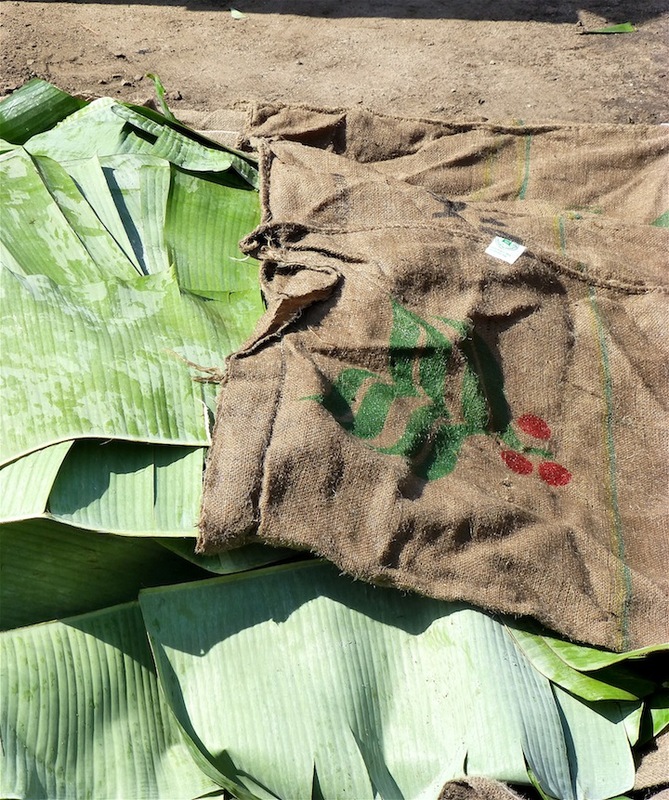 In Ed’s example, another layer of wet hessian sacks were laid on the banana leaves. 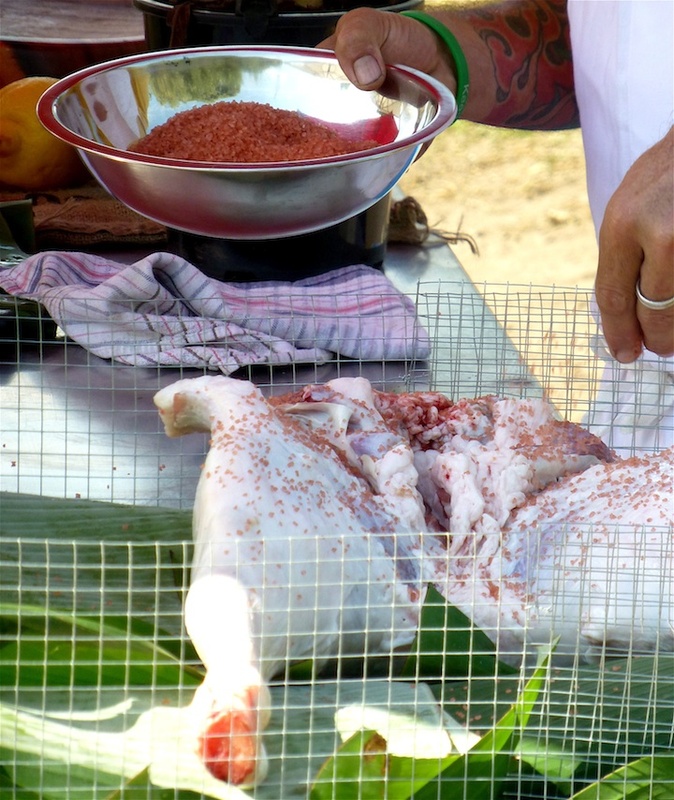 Prior to the workshop, Ed had made up a series of ‘baskets’ from wire mesh, in which he laid a layer of banana leaves……… ………then he prepared the food. 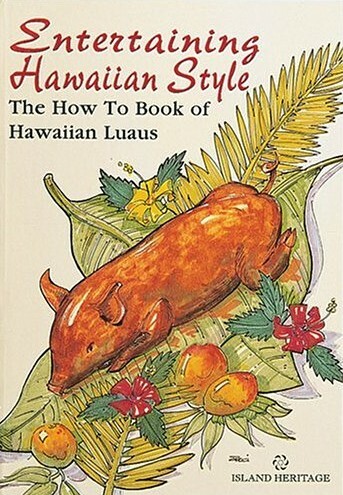 Instead of the traditional pig, Ed used a lamb hindquarter, the surface of which he rubbed down with Hawaiian salt (also known as red clay salt). 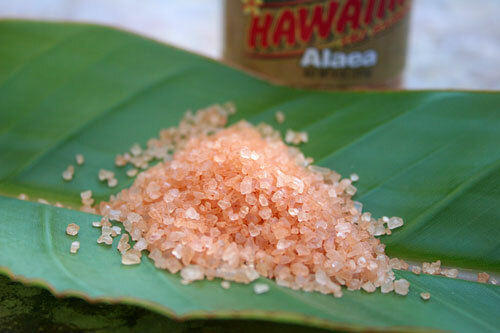 Hawaiian Sea Salt or Alae salt is an unrefined sea salt that has been mixed with a little red volcanic clay, which enriches it with Iron-Oxide. In addition to the salt rubbed lamb, Ed added potatoes and whole cabbages in addition to a couple of pans with experimental contents! Ed had been experimenting with lamb back home for this occasion as well as chicken in cast iron pots, sealed with dough. 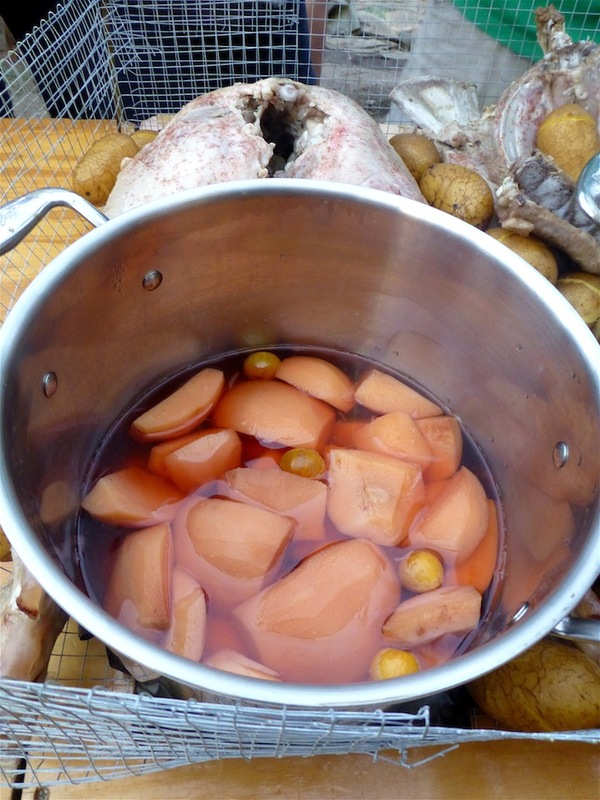 In the two stock pots, Ed had included in his food basket, one was filled with quinces, which he’d never seen before, and the other with the lamb neck, and a load of vegetables. 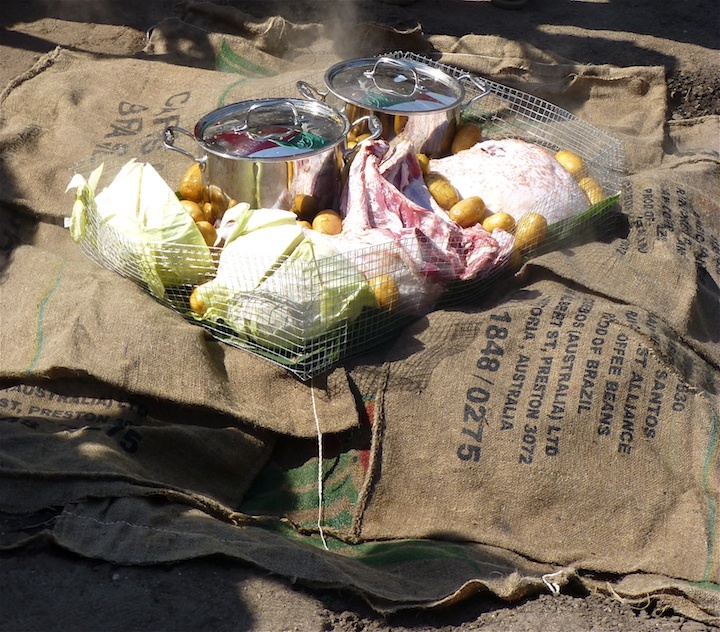 The wire basket of food was then placed on the already steaming wet sacks…….. ………and covered with banana leaves. 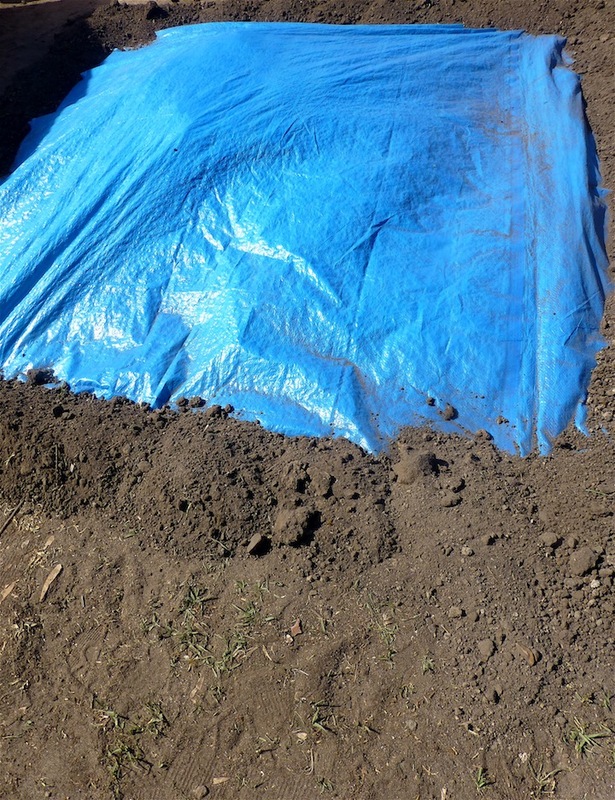 This was then layered with more wet sacks, and sealed with a tarpaulin………… ………which in turn was sealed around the edges with dirt. 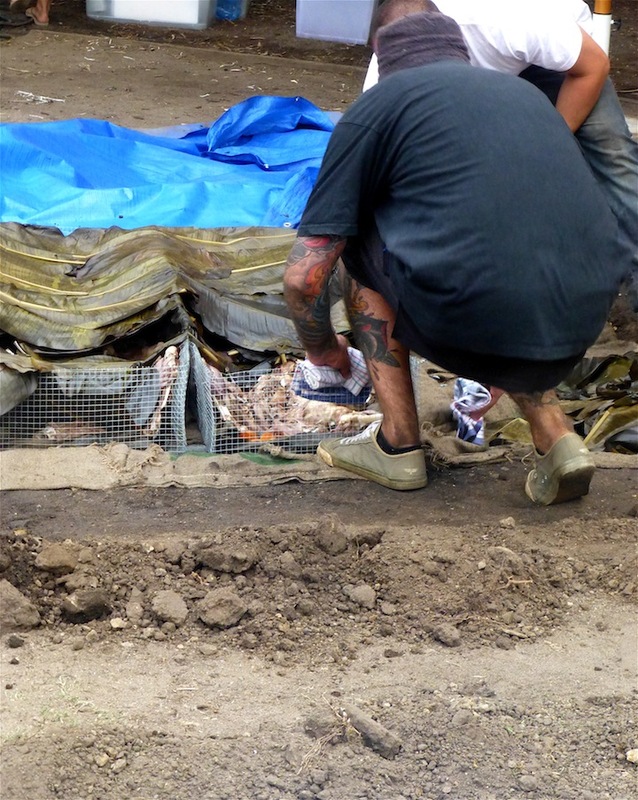 Over the next 3-4 hours, the tarpaulin should puff up – trapping all the steam inside. Because Ed’s version doesn’t involve piling on additional dirt, I was intrigued to know how well the food inside were steamed. The imu that had been laid during the early hours of the morning (a 6-8 hour steaming time) provided fall apart succulence……… ……..the one with just the hindquarter lamb that Ed had laid as his demo, despite only taking 3-4 hours…… ……..was pretty tender, in addition, there were the sweet quinces (which Ed had never heard of before, and was keen to experiment with)…….. …….and a delicious soup of vegetables and meat stock. All in all – this was a most inspiring and informative session by Ed Kenney who impressed me with his humour, his generosity in imparting information and his willingness to experiment. His enthusiasm and respect for the imu is perhaps best summed up by the poem below, written by a friend. as a pail of water.